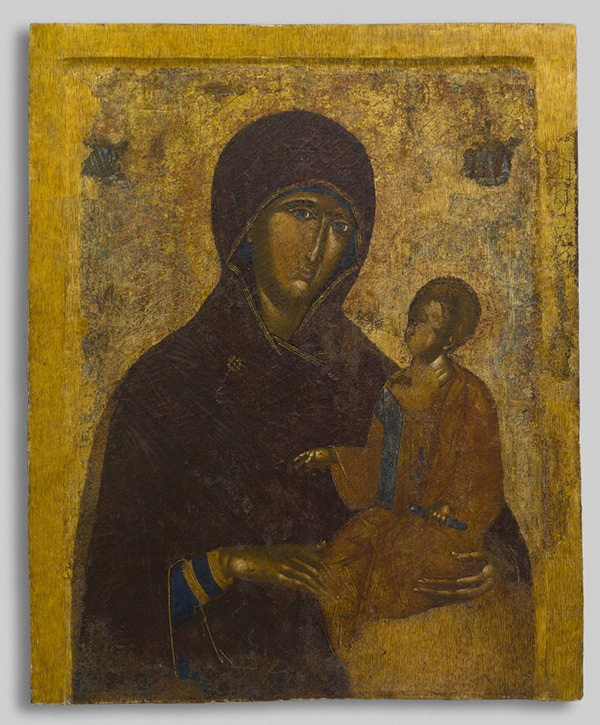 As you walk around our new exhibition Heaven and Earth: Art of Byzantium from Greek Collections at the Getty Villa through August 25, your eye will undoubtedly be drawn to one of the most famous icons of the Byzantine world: the Virgin Hodegetria [OH-deh-GEH-tree-uh]. This iconographic formula depicts Mary holding her child in her left arm, as she gestures to him with the free right hand. The Christ Child, in turn, answers his mother’s intercessory prayer by raising his right hand in blessing. The designation of Hodegetria or “She Who Points the Way” did not originate from Mary’s gesture toward her son. Instead, it refers to the famous prototype of the miraculous icon of the Virgin—the model for all other icons of this type—belonging to the Hodegon Monastery of Constantinople. No evidence exists for the Hodegon Monastery, or any Hodegetria icons, before the Byzantine iconoclastic controversies of the 700s and early 800s. The Virgin Hodegetria came to prominence in the early 11th century, triggering the creation of a myth that linked its origin with the early history of Byzantium. As a way of supporting the legitimacy of icon veneration during the Iconoclasm—controversies that barred the production and use of figural images spanning roughly a century, during the years 726–87 and 815–43—this specific icon was said to trace back to a mid-8th-century legend of a portrait of Mary painted during her lifetime by the Apostle Luke. By claiming the involvement of the hand of the evangelist, the legend around the Hodegetria fabricated evidence for the apostolic origins and divine approval of images. 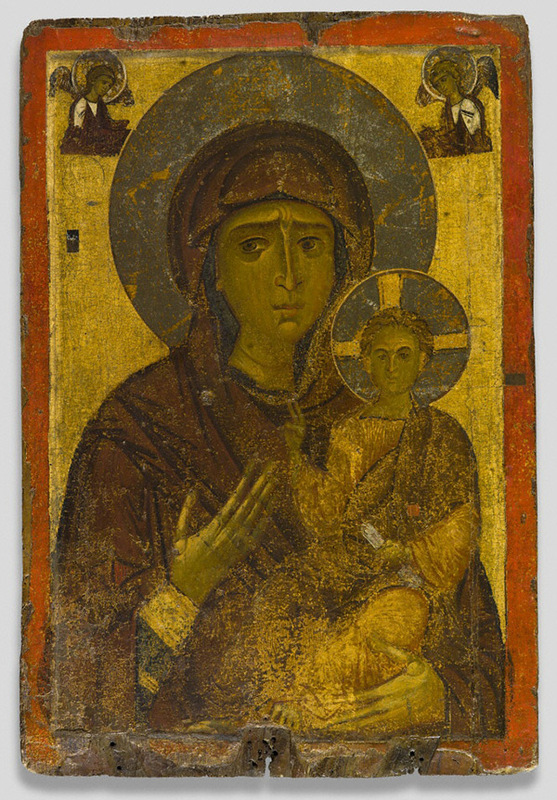 By the second half of the 11th century, the Hodegetria became the best-known icon of Constantinople. From the 12th to the 15th centuries, pilgrims and travelers from various countries would convene every Tuesday when the icon was paraded through the city streets to perform miracles. This weekly ritual consisted of conveying the extremely heavy icon of the Hodegetria on the shoulders of red-vested icon-bearers, who were members of a special family of servants of the Hodegetria. They carried the icon around the market square several times to carve out a sacred space within the profane commercial place for collective supplication, penitence, and liturgical acclamation. Miraculous healings occurred regularly during this rite, with participants receiving special blessings. The clergy would take small pieces of cotton wool and touch the icon, probably to obtain the holy oil it would exude. The most crucial moment of the Hodegetria’s miraculous performance, however, was the effect of the icon “flying” in the air and moving its bearer in a circle. During the weekly processions for this Tuesday litania, the Hodegetria became a visual expression of the process of prayer, which could be seen from a great distance during urban processions. Accordingly, the two sides of the Hodegetria icon from the Church of St. Nicholas shown below visually abbreviate the story from the Incarnation to the Crucifixion. If you look at the other double-sided icons on display in the exhibition, you’ll see evidence of their use in liturgical processions as well. The base of this Virgin Hodegetria from Kastoria, for instance, has square notches for inserting a carrying staff to parade the icon during the reading of the Passion on Good Friday. 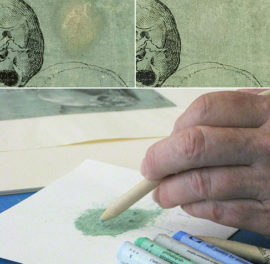 Take a close look at this icon’s base and you will see that the notches have been crudely cut into the border of the painting itself. This indicates that the icon was not created specifically for use in processions. Most likely, the icon was originally part of a templon screen used as a barrier between the church nave and the sanctuary. 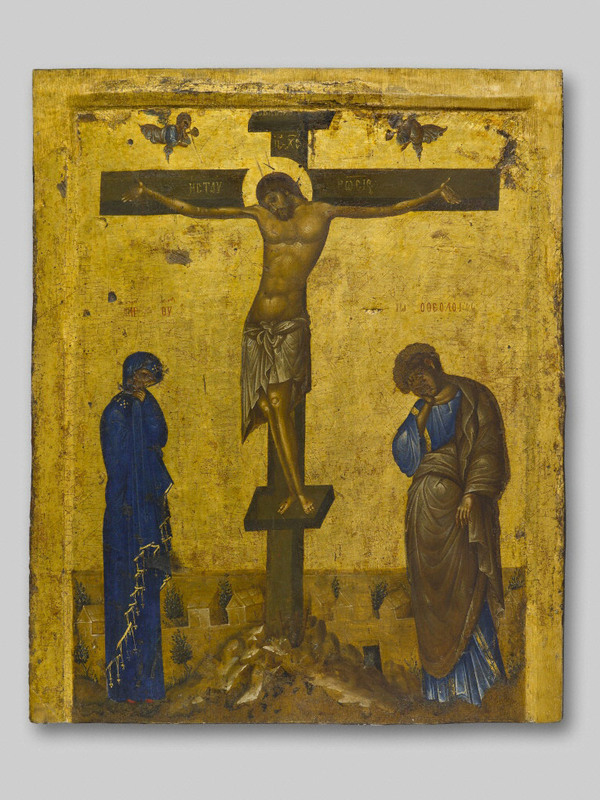 In this case, the Man of Sorrows, an image of crucifixion, would have confronted the priest and the altar. I hope if you visit the exhibition you’ll take a moment to be captivated by this fascinating icon, widely venerated throughout the Byzantine Empire and still to this day. Lidov, Alexi. 2006. “The miraculous performance with the Hodegetria of Constantinople.” In Hierotopy. Creation of Sacred Spaces in Byzantium and Medieval Russia, ed. A.Lidov, Moscow: Progress-Tradition. pp. 311–316. Kalavrezou, Ioli. 1990. 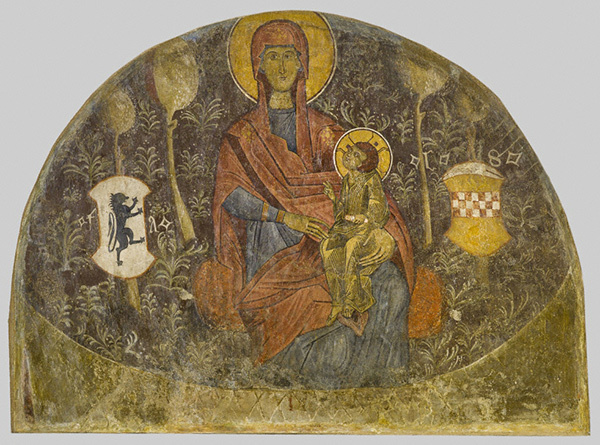 “Images of the Mother: When the Virgin Mary Became Meter Theou.” Dumbarton Oaks Papers. 44: 165–172. Pentcheva, Bissera V. 2006. Icons and power: the Mother of God in Byzantium. 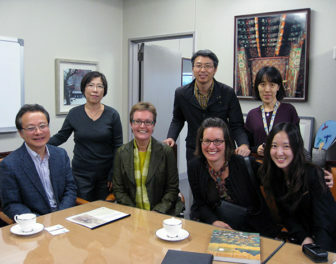 University Park, Pa: Pennsylvania State University Press. Vasilakē, Maria. 2005. Images of the Mother of God: Perceptions of the Theotokos in Byzantium. Aldershot, England: Ashgate Pub. Text of this post © Flora Boros. All rights reserved.